I never considered homeschooling a reasonable option for educating my children. When we lived in San Diego, I had a few friends who chose this unconventional lifestyle and I though they were, well, a little odd. After all, in Southern California, we lived in a great school district that boasted a rigorous academic program in addition to a multitude of parent volunteers. For a mom with a kid just entering the system, I felt like I had won the elementary school lottery with the school my kid’s were attending. I am not a flexible person. I am highly regimented, and a stickler for excellence, especially where it concerns my kids. When my husband’s job moved us cross-country to a foreign land with a mediocre school system, it was too much for this Type A Mom to endure. I was marooned in unfamiliar territory, with a different, impaired curriculum, a whole new gang of kids, and bizarre rules to which we were required to adhere (“What do you mean my kid can’t wear flip flops to school?”). Public, Private, Magnet, What Else? The public schools in our new community were quickly ruled out as a means of education after my daughter suffered through her first grade year. Her reading level plummeted, she learned some choice bad words, and most alarming, she had lost her spark. Somewhere in that overcrowded portable trailer surrounded by shrieking cicadas, she left behind her love for learning. We were desperate for change. The private schools in our area seemed far too rigid (coming from someone like me!) with their rules and regulations, and the magnet schools were just another version of the public education we already bemoaned. I developed an ulcer, agonizing over the next school year rapidly approaching. With my son entering kindergarten and my daughter advancing to grade two, we were running out of options. What if I Damage My Kids? It was my husband who initially urged me to consider the homeschooling route. It is huge in our county, a cult, if you will. With more than 150 families in our small town homeschooling, maybe they knew something I didn’t? Was this the secret to their success? Their kids were seemingly extremely bright (though maybe a little weird). Still, I remained reluctant. I didn’t want to end up another homeschooling causality, wearing a denim jumper and Keds, toting around kids who weren’t “socialized”. And what about all of the Halloween parties and Valentine’s Day cards my kids would miss out on while stuck at home? What about Thanksgiving plays and picture day? What if my method of “schooling” did more damage than good? With fall right around the corner, I continued to research countless schools for miles around. One by one, we eliminated them. Each facility I toured produced more anxiety: the curriculum was lacking, the teachers were inexperienced, or the school was without proper funding. I couldn’t find peace enrolling my kids anywhere. I kept comparing the options to our California kindergarten experience, and the discrepancy was heartbreaking. Homeschooling became the only comfortable choice. I resigned myself to the terrifying proposition, deciding that if I took their education into my own hands, at least I could choose the curriculum and the control the influences. We are now entering our third year of homeschooling, and though I am not a seasoned veteran, I have learned as much as my children along the way. There are so many primary advantages to homeschooling. Each child determines his own academic pace with personally designed curriculum, allowing for advancement or repetition. The school day is extremely efficient, usually completed in half the time of a traditional school day. Homeschooling has also allowed us more freedom to travel according to what is convenient for our own family. All of these benefits are amazing, but I have come to love it for other reasons. I have the unique privilege of learning right alongside my children. When we study an ancient civilization, I get to immerse myself in all of the same books they are enjoying. I now watch the spark as it occurs when they conquer a new math concept, or ace a science experiment. My kids sleep in past eight o’clock most mornings, without the frantic rush of packing lunches and getting to the bus stop on time. Best of all, my nine-year-old daughter doesn’t care who the Jonas Brothers are, we aren’t required to participate in school wrapping paper fundraisers, and we save a ton of money on trendy clothing. No, they are not wearing homemade clothes yet, but they are happily doing their schoolwork in pajamas at the kitchen table. What I initially considered an unfortunate predicament has become a beautiful way of life. I still have random pangs of sadness when I think about my kids missing out on bringing birthday cupcakes to the classroom, but overall, the positives of doing school at home far outweigh any negatives. 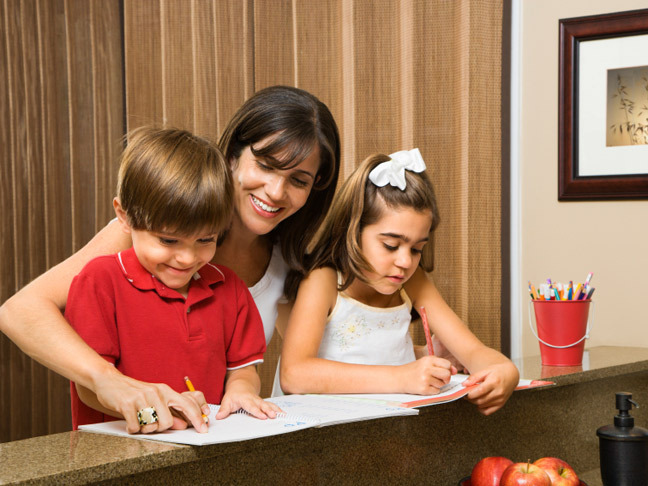 Homeschooling is not for everyone, but for our family, it just makes sense.